The mortgage interest rate deduction has always been a selling point for those on the fence between continuing to rent or jumping into homeownership. While not the determining factor, the deduction is an influencing dynamic for buyers and an overall bonus of investing a large sum of their assets into a home. Currently, the tax break allows homeowners to deduct up to $1 million in interest spent on their mortgage debt, for their primary residence and one additional dwelling. The break also applies to mortgage interest on home equity loans or lines of credit, with a debt threshold of $100,000. While the break is not currently set to be removed, the Republican tax reform plan could restrict the way this tax deduction is applied, rendering it irrelevant to 95 percent of the U.S. homeowner population. The Trump Administration and Congressional leaders are endorsing a tax overhaul that would double the standard deduction and remove breaks for state and local taxes, including property taxes. 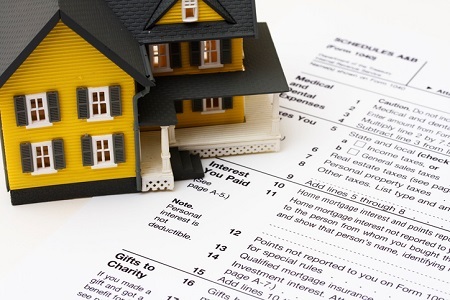 This plan could dramatically increase the number of taxpayers who choose to take the standard deduction instead of continuing to itemize deductions and opt for the mortgage credit. According to an analysis by Zillow, about 30 percent of U.S. homes—those worth $305,000 or more—are currently valuable enough for the mortgage tax deduction to be worthwhile. This number would drop to just 5 percent with the proposed tax plan, skyrocketing the price of an eligible home (deduction-wise) to $801,000 or more. Critics’ steadfast belief is that the mortgage interest rate deduction only helps the wealthy. The National Association of REALTORS® (NAR), however, says otherwise, reporting 7 million taxpayers took advantage of the deduction in 2015. If the deduction is weakened, critics’ assumptions will turn to reality and the real estate market could see a drop in buyer activity, as the tax break incentive would no longer be beneficial for the majority of homeowners. Zillow reports that itemized deductions and the mortgage interest rate tax currently benefits specific markets with expensive communities. On the current plan, 96 percent of homes in Los Angeles, Calif. are a financially viable choice for the deduction. Comparatively, in Pittsburgh, Pa. and St. Louis, Mo., only 10 percent and 13 percent of homes, respectively, benefit from the deduction. If the proposed plan is approved, those numbers would drop to 30 percent for Los Angeles, 1 percent for St. Louis and even less than 1 percent for Pittsburgh. Income status is but one variable—the racial wealth gap rears its ugly head when it comes to the break. Doubling the standard deduction would only widen the gap, according to The National Low Income Housing Coalition (NLIHC). A report by NLIHC and the Institute on Assets and Social Policy (IASP) at Brandeis University’s Heller School states that African Americans and Hispanics currently only receive 6 and 7 percent of the benefits from this tax break, even though they make up 13 percent of the nation’s households. White households, however, receive almost 80 percent of the tax break’s benefits. The proposed tax reform could slant benefits towards the white and wealthy populations, worsening an already wide rift. The National Association of Home Builders (NAHB), however, is shifting its stance on the issue. At press time for the initial announcement from the White House, the NAHB released a statement on the possible repercussions of a higher standard deduction. As of Oct. 3, the NAHB is welcoming specific terms of the proposed overhaul. The debate is creating a divide of opinions regarding tax policy—an issue that the NAHB and NAR typically stand on the same side of. The NAHB will promote a tax policy that includes a homeownership tax incentive, low-income housing credit, remodeling incentive with a focus on energy efficiency, deduction on interest for small businesses and capital gains exclusion for those who sell their principal residence. The proposal continues to be examined by economists and the real estate industry. On Oct. 16, the White House released its first economic analysis of the Republican tax plan during a CNBC interview. Chief Economist Kevin Hassett states that the GOP goal of decreasing the corporate tax rate from 35 to 20 percent will result in a windfall for workers. According to Hassett, the average U.S. household income could jump at least $4,000 a year, but could rise as much as $9,000 annually.